South Africa has the highest wage inequality in the world, according to a new study by the International Labour Organisation (ILO) into hourly wages among 64 countries. It further finds that South Africa has a Gini coefficient for wage inequality of 63.9. The Gini coefficient is a measure used to show income or wealth distribution of a nation’s residents. A Gini coefficient of zero expresses perfect equality, while a Gini coefficient of 1 (or 100%) expresses maximum inequality. The report goes on to state that globally, women continue to be paid about 20% less than men. “The gender pay gap represents one of today’s greatest manifestations of social injustice, and all countries should try to better understand what lies behind them and accelerate progress towards gender equality,” says ILO director-general Guy Ryder. According to the report, in high-income countries the gender pay gap is wider at the high end of the pay scale, while in low- and middle-income countries the gender pay gap is wider among lower-paid workers. 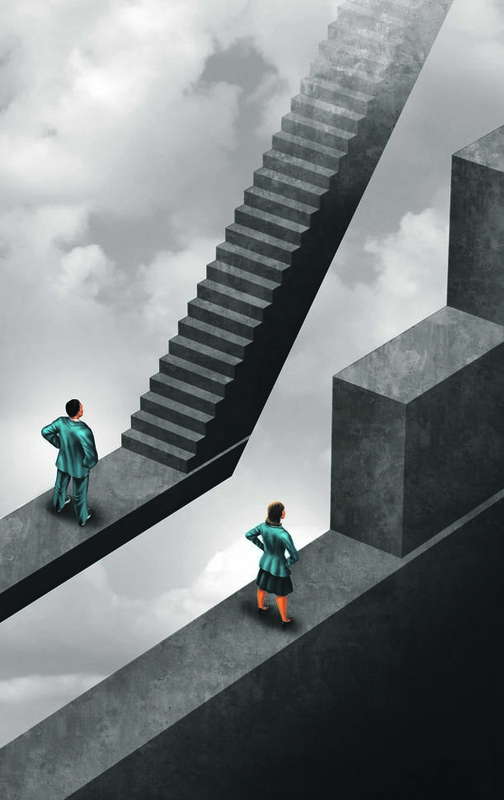 Using empirical evidence, the report also shows that traditional explanations – such as differences in the levels of education between men and women who work in paid employment – play a limited role in explaining gender pay gaps. “In many countries, women are more highly educated than men but earn lower wages – even when they work in the same occupational categories,” says Rosalia Vazquez-Alvarez, econometrician and wage specialist at the ILO, and one of the report’s authors. “The wages of both men and women also tend to be lower in enterprises and occupations with a predominantly female workforce,” she says. Another contributing factor in the gender wage gap is motherhood. The report finds that mothers tend to be paid lower wages compared to women who are not mothers. This may be related to a host of factors, including labour market interruptions, reductions in working time, employment in more family-friendly jobs with lower wages, or stereotypical promotion decisions at enterprise level. The report also finds that motherhood brings a wage penalty, while fatherhood is consistently associated with a wage premium. According to the report, a more equitable sharing of family duties between men and women would, in many instances, lead to women making different occupational choices. Surprisingly, the evidence shows that even before women become mothers, there is already a pay gap. This highlights the need to combat stereotypes and discrimination at the point of entry into the labour market. The report finds that “gender polarisation” is an important determinant of wages and that in Europe, working in an enterprise with a predominantly female workforce can bring about a wage penalty of nearly 15%, compared to working in an enterprise with similar productivity but a different gender mix. Turning to global wage growth, the report claims that in 2017 it fell to its lowest rate since 2008. It claims that in real terms, which is adjusted for price inflation, global wage growth declined to 1.8% in 2017 from 2.4% in 2016. These findings are based on data from 136 countries. Over the past decade, from 2008 to 2017, the ILO study puts South Africa’s real wage growth at 2.4%. In analysing wage growth, the report finds that in advanced G20 countries, real wage growth declined from 0.9% in 2016 to 0.4% in 2017. In contrast, in emerging and developing G20 countries, real wage growth fluctuated between 4.9% in 2016 and 4.3% in 2017. In the past 20 years, average real wages have almost tripled in emerging and developing G20 countries, while in advanced G20 countries they have increased by just 9%, the report shows. The report finds that globally women continue to be paid about 20 per cent less than men. “The gender pay gap represents one of today’s greatest manifestations of social injustice, and all countries should try to better understand what lies behind them and accelerate progress towards gender equality,” said ILO director general Guy Ryder in a statement. Another factor which weighs on the gender wage gap is motherhood. The report shows that mothers tend to have lower wages compared to non-mothers. The report finds that motherhoods brings a wage penalty while fatherhood is persistently associated with a wage premium. Surprisingly, the evidence shows that even before women reach motherhood, there is already a pay gap. This suggests a need to combat stereotypes and discrimination at the point of entry into the labour market. The report finds that ‘gender polarization’ is an important determinant of wages and that in Europe working in an enterprise with a predominantly female workforce can bring about a nearly 15% wage penalty compared to working in an enterprise with similar productivity but a different gender mix. Turning to global wage growth, the report found that in 2017 fell to its lowest rate since 2008. The report found that in real terms, which is adjusted for price inflation, global wage growth declined to 1.8 per cent in 2017 from 2.4 per cent in 2016. The findings are based on data from 136 countries. Over the ten years from 2008 to 2017, the ILO put South Africa’s real wage growth at 2.4%. In analyzing wage growth, the report finds that in advanced G20 countries real wage growth declined from 0.9 per cent in 2016 to 0.4 per cent in 2017. 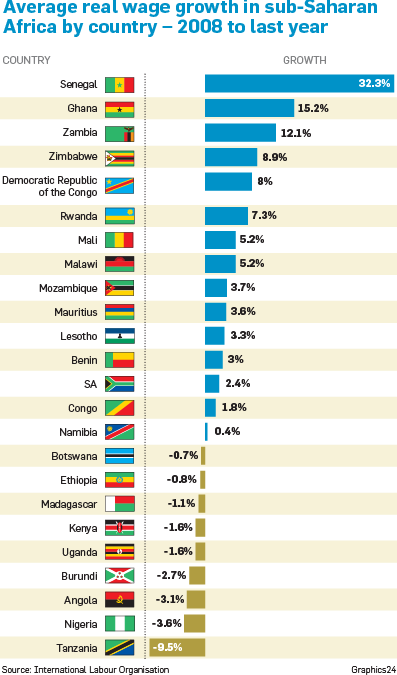 By contrast, in emerging and developing G20 countries, real wage growth fluctuated between 4.9 per cent in 2016 and 4.3 per cent in 2017. In the last 20 years, average real wages have almost tripled in emerging and developing G20 countries, while in advanced G20 countries they have increased by just 9 per cent, the report shows.